It’s not finished with fall and spring is fast approaching! As you reflect on your fall garden, you should also be contemplating your spring garden as fall is the perfect time for planting spring-flowering bulbs. Bulbs possess an almost magical quality: the ability to shed the dreary gray days of winter and provide reassurance that spring is here. Tulips and daffodils are two of the best known and most popular spring bulbs. Bulb catalogs have probably arrived in your mailbox. 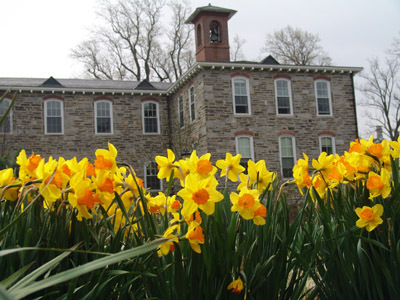 In Pennsylvania and throughout the northeastern United States, bulbs that flower in spring are typically planted in October or November. Bulbs should be planted as soon as possible but can be stored in a cool space for a couple weeks if necessary. Planting can occur until the ground begins to freeze. 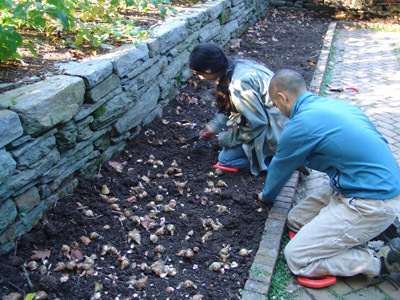 A common question many gardeners have is how many bulbs should be planted in an area. Standard hybrid tulips should be planted about 5 per square foot; small species tulips about 9 to 13 per square foot; and miniature daffodils about 7 to 11 per square foot. Both daffodils and tulips should be planted about 6 inches deep, or about 4 inches for smaller bulbs. 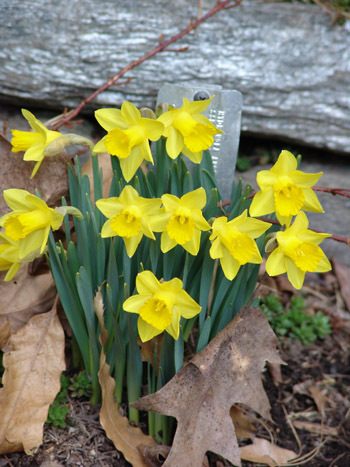 Daffodils are perfect for areas that require rodent- or deer-resistant foliage. 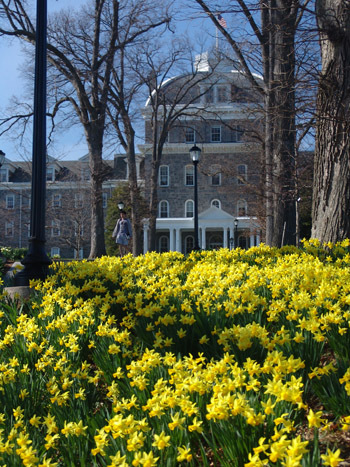 If daffodils are provided lots of sunshine and good drainage,and foliage is allowed to die back naturally, bulbs will perennialize, increasing in size each season. 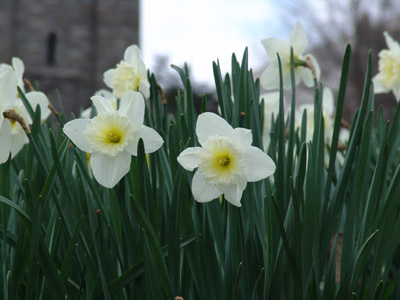 Daffodils need at least 6 hours of direct sun every day for 8 weeks or more after they bloom. They like a neutral (7.0) pH sandy loam and low-nitrogen (preferably organic) fertilizer just before blooming. An overabundance of nitrogen results in lush foliage and few flowers. If you have clay soil, amend it with sand and/or aged neutral pH leaf compost a foot deeper than the bulb planting depth. Then enjoy the blooms! Next deadhead the spent flowers. Wait 8 weeks or more after blooming (until the leaves turn yellow) before cutting the foliage. One trick to mask fading foliage is to plant daffodils mid-border. By doing so, other emerging plants mask the foliage while allowing the bulbs to rebuild their energy reserves. Tulips originated in Turkey and throughout the mountainous regions of central Asia. Divided into over a dozen different divisions, tulips fall into two general categories. Hybrid tulips are bred for strong stems and large flowers. Bulbs utilize vast amounts of energy to create a dramatic flower. 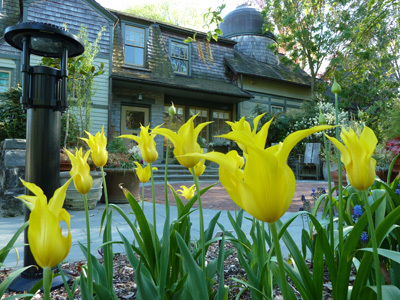 Species tulips, with smaller, more refined blooms, are an ideal option for those wanting a perennial tulip. 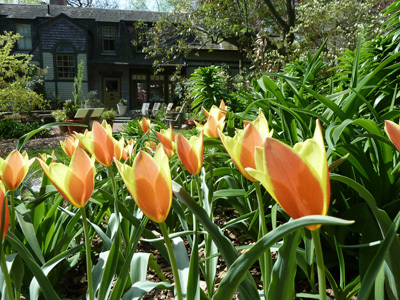 Species tulips tend to be smaller in stature and are ideal for rock gardens, border edges, and small intimate gardens where their unique forms can be appreciated. 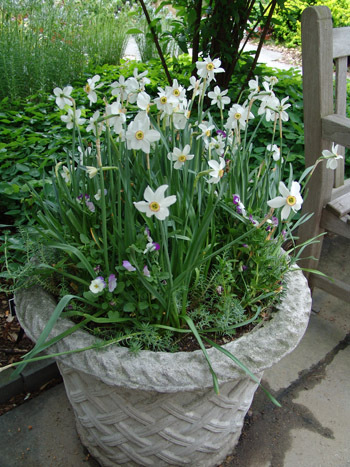 Bulbs can also be grown in containers. Both daffodils and tulips do very well. It is best to use a container at least 24 inches in diameter to insulate the bulbs from very cold weather. Make sure the container has holes for good drainage. Plant the bulbs in a single layer the same depth as you would in the ground. Or you can try a layering method similar to making lasagna. Place larger bulbs like tulips and daffodils on the bottom layer. Add a layer of soil. Smaller bulbs like crocus, winter aconite, and Muscari sit atop the larger bulbs. Cover with several inches of soil. The soil should be a good potting soil mix. Store the container in a cool, dark area, either outdoors, a storage shed or your basement if it stays very cool. Since the bubs are growing roots at this point, check the pot often to make sure the soil does not dry out. Once the weather begins to warm and you see green shoots, move the container to an area with light. At this point, you can enjoy the show or add cool weather flowers or plants, such as pansies or lettuce, in the pot with your blooming bulbs. Continue to make sure the bulbs have enough water. Keep containers moist but not soggy. Find unique cultivars of theses classic bulbs and more at the Scott Associates Plant Sale on September 20-22, 2013. Beautiful! In Texas we’re in the middle of a historic drought. Gardening here is not for the faint of heart.